Do not underestimate the power of a person to cope. He may be dependent now but deep within him lies the energy to adapt. I remember a particular a particular patient when I was still an ICU nurse. He was a pastor afflicted with a serious liver problem. Specialists come and go at his ICU bed but they cannot seem to diagnose the problem. Time is running out and the pastor is slipping fast. He’s bleeding and God knows how many units of blood have been transfused to him. He went into coma. Doctors were giving up, and so were we. We’ve primed the family but they just won’t give up…yet. The wife is always there at his side during visiting hours, always cheerful and full of hope. So is the daughter who even lets her dad listen to praise songs as if he is not comatose. 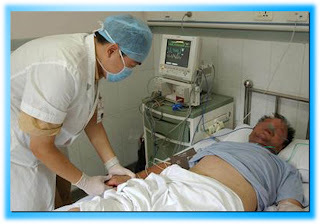 Many days passed and to our amazement, the pastor woke up from coma. It’s been uphill from there. Everything just fell into the right place. He was transferred to a regular room and eventually discharged with a clean bill of health. Amazing? What could it be? A miracle? Or could it be the medications working, or the transfusion? Or the family’s fervent prayers? We couldn’t tell but one thing is certain: human beings are made to persist. And that is what Sister Callista Roy believed, too. Sister Callista Roy is a member of the Sisters of Saint Joseph of Carondelet. She received a bachelor of science in nursing from Mount Saint Mary’s College in Los Angeles California, a master of science in nursing from UCLA, and a master’s degree and doctorate in sociology from UCLA (Philips, 2002). Roy first proposed the RAM while studying for her master’s degree at UCLA, where Dorothy Johnson challenged students to develop conceptual models of nursing (Philips, 2002; Roy & Andrew, 1999). She received many honors and awards for her scholarly and professional work and is currently the Graduate Faculty Nurse Theorist at Boston College, School of Nursing (Roy, 2000). Johnson’s nursing model was the impetus for the development of Roy’s Adaptation Model. Roy also incorporated concepts from Helson’s adaptation theory, von Bertalanffy’s system model, Rapoport’s system definition, the stress and adaptation theories of Dohrenrend and Selye, and the coping model of Lazarus (Philips, 2002). In the Adaptation Model, assumptions are specified as scientific assumptions or philosophical assumptions. Systems of matter and energy progress to higher levels of complex self- organization. Humans by their decisions are accountable for the integration of creative processes. Integration of human and environment meanings results in adaptation (Roy&Andrew, 1999, p.35). Human meaning is rooted in the omega point convergence of the universe. God is intimately revealed in the diversity of creation and is the common destiny of creation. Persons use human creative abilities of awareness, enlightenment, and faith. Persons are accountable for the processes of deriving, sustaining and transforming the universe (Roy & Andrew, 1999, p. 35). Reading through Roy’s adaptation theory, I now understand man’s immense capacity to adapt. I believe in a higher power, I believe in miracles, but I believe, too, that the greater miracle is the perfect interplay of all the factors that push a person to adapt at various modes. Physical and chemical processes involved in the function and activities of living organisms; the underlying need is physiologic integrity as seen in the degree of wholeness achieved through adaptation to change in needs. Focuses on psychological and spiritual integrity and sense of unity, meaning, and purposefulness in the universe. Roles that individuals occupy in society, fulfilling the need for social integrity. It is knowing who one is in relation to others. individually and in groups and the adaptation potential of these groups. So how did the pastor recover? At the physiologic level, it was good that he was brought to the ICU immediately since the basic physiologic needs are met at once. He was intubated (for oxygenation), an NGT was put in place (for nutrition), a foley catheter was inserted (for elimination), and enema was also done to facilitate elimination of wastes. Visitors were restricted early on to provide optimum rest and to minimize cross contamination. Isolation measures were also instituted. Routine ICU care, so to speak. Every time the patient is assigned to me, I try to talk to him as if he listens and can answer. His churchmates were also there every time they are allowed to see him telling him that they are waiting for him at their church. The wife and the daughter never gave up on him. They are always there to tell him how much they love and need him. The adaptation process was a long one, but he did adapt and went on to recover. The ICU environment is not a very ideal place for adaptation, but given the situation and condition of the patient at that time, it was the best place to support the body’s power to adapt. Using Roy’s six –step nursing process, the nurse assesses first the behaviors and second the stimuli affecting those behaviors. In a third step the nurse makes a statement or nursing diagnosis of the person’s adaptive state and fourth, sets goals to promote adaptation. Fifth, nursing interventions are aimed at managing the stimuli to promote adaptation. The last step in the nursing process is evaluation. By manipulating the stimuli and not the patient, the nurse enhances the interaction of the person with their environment, thereby promoting health. Hamner in 1989 discussed the Roy model and how it could be applied to nursing care in a cardiac unit (CCU). Hamner describes the model as enhancing care in the CCU and being consistent with the nursing process. Hamner found that the model assessed all patients’ behavior, so that none was excluded. The author discovered that the Roy model provides a structure in which manipulation of stimuli are not overlooked. The model puts emphasis on identifying and reinforcing positive behavior which speeds recovery. The adaptation model is also useful in educational setting. Roy states that the model defines for students the distinct purpose of nursing which is to promote man’s adaptation in each of the adaptive modes in situations of health and illness. 2. Developing teaching tools suitable for student learning. 4. Obtaining competent role models. If research is to affect practitioners’ behavior, it must be directed at testing and retesting conceptual models for nursing practice. Roy has stated that theory development and the testing of developed theories are nursing’s highest priorities. 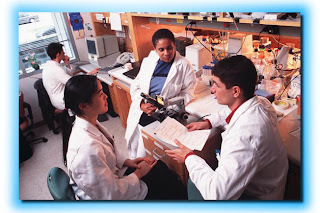 The model must be able to regenerate testable hypotheses for it to be researchable. Fawcett and Tulman used the model for the design of studies measuring functional status after childbirth. They also used the model for retrospective and longitudinal studies of variables associated with functional status during the postpartum period. The model was also used for ongoing studies of functional status during pregnancy and after the diagnosis of breast cancer. The model facilitated the selection of study variables and clarified thinking about the classification of study variables. The model was a useful guide for the design and conduct of studies of functional status. hello there!! First of all congratulations!!! you have proven that we could really make interesting and substantial articles...!!! I was touched by the story... although I would like to know how long it really took him to recover from coma.. I now have a clearer view of what the theory is all about!!! thanks and hope we could hear more from your group!!! Whew!!! Natapos din... Sa lahat ng nag-care at nakialam, salamat po. To Joyzen, David, at Sean, sa mga late night chats natin- from Roy, to nganga, to lovelives at samu't sari pang kwentuhan, salamat. To Jesper (Pender group) na walang sawang nagpapaalala sakin everytime may new updates sa moodle, salamat din. Kay Gen, na lagi nagtetext kung ano maitutulong nya, at kay Jane na humabol din para tumulong, salamat! At sa "techie" friends kong sila Annie at Marco, maraming salamat for keeping me afloat sa mga panahong "toxic" ako. Salamat! Hi Issa! Thanks for the comment. When I was reading through Roy's theory, that particular patient instantly came to mind. He was in the hospotal for almost two months, pabalik-balik sa ICU. The longest duration that he was in coma was about three weeks if I remember it right. Then he was transferred to a regular room and eventually discharged. The last time I saw him was in the hallway, walking, aided by only a cane, when he came back for his follow-up check up. Truly, the body heals on its own...and I still believe there is a God. Good day! Great job! You have successfully presented Sister Calixta Roy's theory in a brief and comprehensive manner. Truly, it's easier to impart knowledge on others by sharing your own experiences. Utilizing the pastor's case to present the theory makes it easier for us readers to relate on what you are talking about. These theories are mere theories on paper unless we nurses utilize it in our everyday practice. Congratulations. Great job! Sister Callista Roy developed the Roy Adaptation Model, which is based on the belief that the human being is an open system. 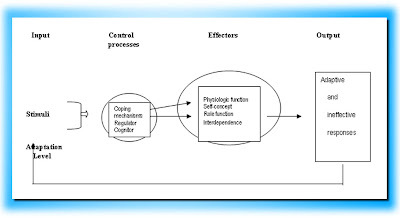 The system responds to environmental stimuli through the cognator and regulator coping mechanisms for individuals and the stabilizer and innovator control mechanisms for groups. The responses occur through at least one of four modes—physiological-physical, self-concept-group identity, role function, and interdependence. The responses in these modes are usually visible to others and can be identified as adaptive or ineffective. Adaptive behaviors that need support and ineffective behaviors are then analyzed to identify the associated stimuli. The major stimulus leading to one of these behaviors is the focal stimulus; other stimuli that are verified as being involved are contextual, and stimuli that might be involved but have not been verified are residual. 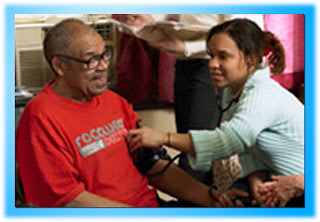 Nursing care focuses on altering stimuli or strengthening adaptive processes to result in adaptive behaviors. Roy's work is a conceptual model that views the individual as an adaptive system that is a biopsychosocial being required to adapt to environmental stimuli. 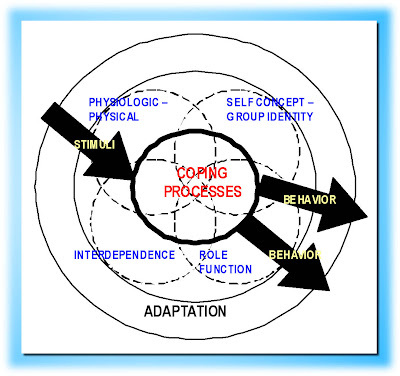 Adaptation is considered to take place in one biological and three psychosocial modes. I must say I was particularly spiritually enlightened with the pastor’s story. With all there is to define the word “adaptation”, this should be apparent: one shall decide that it needs to. The responses to the environment and to a particular situation entail a great deal of motivation from the one involved. I am honestly impressed with the article. It was briefly and substantially presented to create a comprehensive view of Sister Callista Roy’s Adaptation Theory. I regret to not have been actively involved with the material. It is good. But at least it is never too late. Congratulations group mates! one thing i noticed, i could not read the texts in the first diagram. it looks interesting. what is it about? Thanks for the simple layout of Roy's Model. The shared story was a great example, and provided clear understanding of application. I have one question though: Under the Modes of Adaptation, no. 4- is this a description of the Interdependence Mode or separate info? I just noticed that this point is not aligned with previous points. Is any of this original material? I have seen all of this on other sites... including the models you posted. This is plagiarism if you do not site your references. May I have your citation of Roy's quotation? I would love to cite it as well in a paper I am writing for Nurse Theory. well, sister callister roy's theory is a suitable nursing theory, but i'm finding it difficult to aply to my research study, pls can you help me out? my research topic is: assessment of factors influencing the prevalence of malaria among pregnant women.